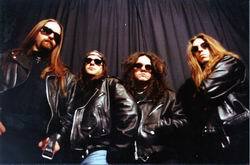 Hanker (1991-present) is a NWOBHM band from Beaupre, Quebec, Canada. anker started in 1985 originally under the name Cobalt in Quebec City, Quebec, Canada but Hanker was later chosen after a search through the English dictionary; "Hanker" means "craving for something" . They modeled their traditional heavy metal sound after the NWOBHM greats of the 1980s mixed with a strong helping of power metal in the styles of Iron Maiden, Gamma Ray, Judas Priest and Helloween. In 1991, their first recording, a self-title five track demo received play on Canada's 'Much Music' video TV station. In Our World, their debut CD followed in 1994. They became most known for their follow-up 1997 release The Dead Ringer, their second outing under the membership of Pascal Cliché (keyboard/vocals/guitar), Patrick Gravel (guitar/back. vocals), Martin Jones (bass) and Luc Guay (drums), which received rave reviews with tracks being featured on many compilations, most notably Derek McDonald's fledgling start-up 'Emperor Multimedia' who featured the track You Won't Live Eternally on their debut 1999 compilation The Alliance. After a failed and short-lived relationship with a different Toronto area record company, they would release their third outing, Snakes And Ladders (2000), a loose concept on the crooks in the music industry - mostly influenced by their recent experiences. Web Of Faith would appear in August of 2004 on the 'Skyscraper Music' label with Dennis Cossettle on bass. Since the release of Conspiracy of Mass Extinction (2010) with the membership of Patrick Gravel (guitars), Pascal Cliche (guitars/vocals/keyboards), Laurent Imbeau (bass) and Sylvain Tremblay (drums) the act has been silent.